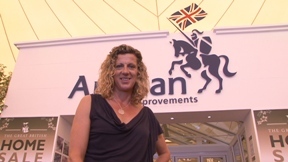 Anglian Home Improvements are sponsors of various different Olympic athletes competing at London 2012, including former gold medalist Sally Gunnell. She has written us a blog about what she has been up to and her excitement for the start of the Olympics. I was surprised to find myself back up at the Hampton Court Flower Show with Anglian the other day; can it really be a year since I was there with you? I always wonder how the show can raise the bar each year, but somehow they manage it. I like to think that I can turn my hand to the land a little bit, being a farmer’s daughter. But to be honest, I’m not quite on the same level as the geniuses who transform this place every year. If you missed the show, you can check out some of the best sights on the Anglian website, including the Anglian-sponsored Grapevine Theatre. I’ve been chatting with a few of our Team GB athletes over recent days; their coaches have enforced the “lock-down”, meaning a ban on press engagements and appearances. It’s at this point that the athletes go in to their pre-Games bubble. I remember it well; training, eating, stretching, hydrating, training, sleeping, stretching, training…you get the picture. I often had the weird experience of time crawling by; then I’d blink and find a week had gone. It’s so important to have a good mental approach to these last few weeks, because life becomes somewhat abnormal. Another reason for needing good mental strength is speed work. The track athletes will be well in to their speed sessions now. They’re short. They’re brutal. They can often lead to niggles. If you’re going to peak at the right time, you have to do the speed work…and you have to roll with the niggles and trust the team around you to manage them. I’ve had a few people get in touch and ask me about the GB athletics team selection for the Games. The first thing I’d say is that there’s always controversy when the team list comes out; 2012 is no exception. Yes, we’ve only got one 800m runner in there and yes, Dwain Chambers was caught for a doping offence and is now back in the fold. But to me, it’s about every single one of them justifying their place in the Team. Some good people aren’t there, so for those that are, it’s time to get over being chuffed and get down to the job in hand. I wish them all huge amounts of luck. A first for me at these games will be the opening ceremony. I never got to go when I was competing, because I was always away in holding camps. So, in my capacity as BOA Ambassador, I shall enjoy taking my seat and soaking it all up. That plus the torch relay (I’m in Bognor on 16 July) mean that this is shaping up to be a wonderful experience. Another week, another trip; I’m off to Barcelona, almost twenty years to the day since I won Olympic Gold there. It’s going to be a special visit with the up-coming anniversary. I’m looking forward to a sangria!